In our new column, "Industry Insider," we interview people who work in the fashion business. This month we talk with brand representative Tiffinee Harmon of San Francisco's sales agency, SparklingOrFlat. Photos above: Tiffinee Harmon; color swatches that she uses when helping retailers make orders for Maguba; and a favorite of the Maguba clog collection. What do you do as a fashion industry insider? I have a sales agency that represents footwear designers in the contemporary market. At the SparklingOrFlat Showroom, we sell our brands (wholesale) to retailers, who then sell to the end consumer. We are involved in the design, development, distribution, merchandising, and brand identity in the marketplace. Being the liaison between the designers and the retailers gives us tremendous insight to affect positive change and results. We are able to communicate the needs of retail to our designers/production and also communicate our brands’ story, heritage, and selling points to the buyers so that there is a fluid synergy between both the creators and our target consumer. Being a brand ambassador for my current Scandinavian collections (Maguba and Tretorn Footwear) is a dream come true. I have always held an affinity towards Scandinavian design, and to be able to work side by side with the choice people behind both of these Swedish labels is incredible. It’s the humanity of this business that keeps me going. Being a good partner to the small business/boutique owners is especially keen for me. What's a day in the life of Tiffinee Harmon like? It varies, depending on the season. Currently, our brands are designing collections for 2015, while we are selling the Autumn/Winter 2014 collection to our retailers, which will hit their floors starting in July. We are also insuring that our retailers are fully stocked and/or replenished with Spring 14 goods for the season. So, right now my days are filled with setting appointments, showing the collections, following up on previous appointments, collecting orders, lots of customer service, reorders, prepping photo shoots, training store staff on product knowledge, etc. I have always been into fashion, but 15 years ago, it wasn’t my career or even a notion. I was working in L.A. in television as a writer/script supervisor, and my friend was a buyer for a store back home (Oklahoma). We had our tradition of meeting for lunch when she would come to L.A. for her buying trips. One afternoon, I joined her on her showroom appointments and started working part-time during my show hiatus. When my show didn’t get picked up for the next season, it turned into a full-time gig as a sales rep and in 2009, I made the jump and went into business for myself with my indie rep agency. What sets Maguba apart from other footwear companies? We offer complete customization to our buyers. They are able to pick from 20 silhouettes, choose their upper color and material, the color of wood and the shape of the heel. Not many footwear brands out there have this capability. It allows my retailers to get creative and curate their own assortment of Maguba, by essentially designing every single pair. Learn more about Tiffinee Harmon at sparkingorflat.com, and learn more about Maguba clogs at maguba.com. 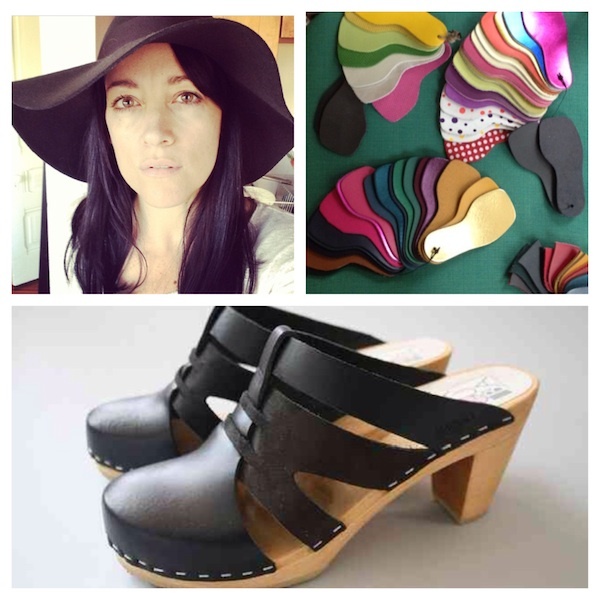 Find Maguba clogs at Stripe in Santa Cruz, and at Onyx and Mill Mercantile in San Francisco.